Wallis’s career as an artist began only at the age of seventy. 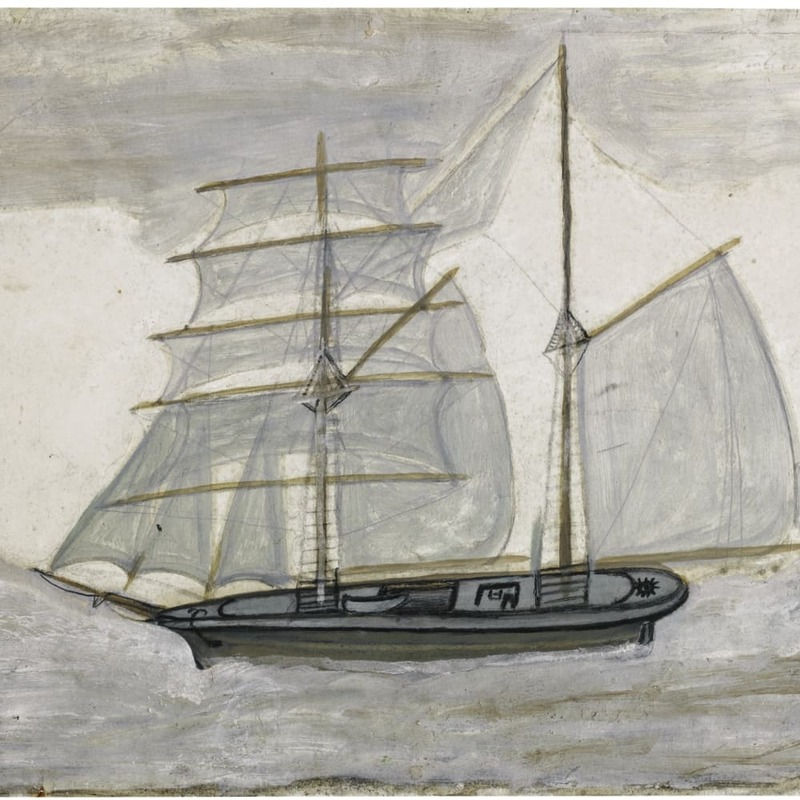 Little of his life prior to this is known, except that he came from Devon and arrived in St. Ives (the subject of most of his paintings) in 1890 as a marine rag-and-bone dealer. He had been born into a poor family and probably never attended school, accounting for his semi-illiteracy. He started work as a cabin-boy at the age of nine, and is believed to have worked at sea from then on. Wallis was finally relieved of financial worries when he received his old-age pension and took up painting ‘for company’. His neighbour recalled how one day he said:‘Aw! I dono how to pass away time. I think I’ll do a bit of paintin’. At a time when painting was an occupation reserved almost exclusively for gentleman, Wallis was considered to be rather eccentric, if ”not exactly right in his head”. However, through his friendship with Ben Nicholson and Christopher Wood, he managed to find patrons. Despite the fact that he started painting at such a late stage in his life, he produced a huge number of paintings, churning out two or three each day. Wallis’s paintings betray a deep nostalgia for the fishing industry of his youth. He had witnessed the Cornish fishing industry flourish and then flounder and die and could remember when the harbour at St. Ives had been crowded with mackerel boats or schooners had been loaded up with Cornish pilchards bound for Italy. His painting style might be described as naive but it was precisely because Wallis was so concerned with reality that his paintings appear to evade realism. It was an experience that Wallis endeavoured to convey rather than a description of reality.